About 2 months ago, I decided to try my luck at applying to be a food vendor at a flea market. I'd been toying with the idea of selling my granola but had resisted - mainly because I really had no idea what was involved. Its been about a month since I got the go ahead, and I won't lie, the past few weeks have been tough; countless phone calls gone unanswered, hours scrolling through google, and juggling the logistics of this whole process. But, fast forward to today, and here I am, prepping to sell bags and bags of granola at the Junction Flea on Sunday. Drop by for a visit if you can! 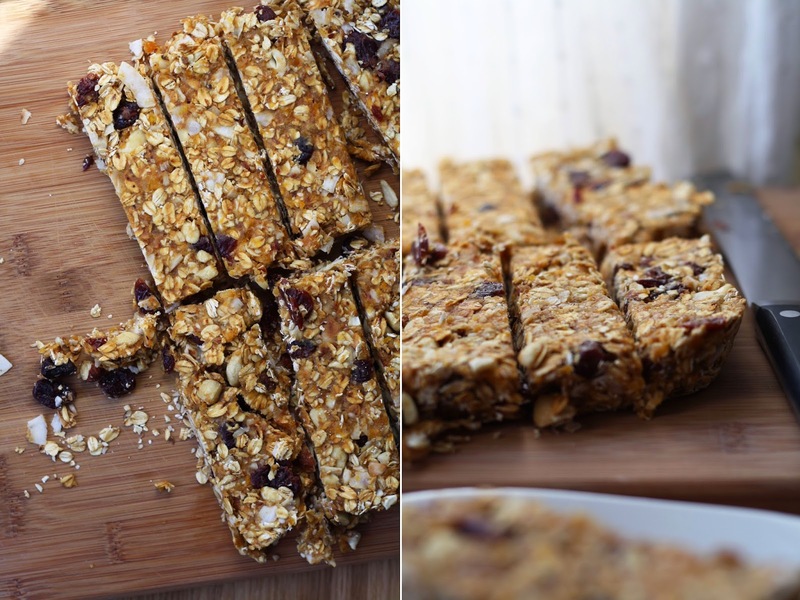 It seemed only appropriate that this week's post was all about oats. Doesn't hurt that its the perfect snack for weekend hikes, road trips and cottage getaways. Happy long weekend folks! I've made these twice in the past 3 weeks, they are just THAT good. Be warned that though these are no bake, there are a few steps involved in the process. Don't get impatient, they are totally worth it! With dates, apricots, nuts and seeds, these bad boys will keep you full for hours! Place the apricots and dates in a small bowl. Fill with warm water and let soak for 10-15 minutes. Spread the oats on a parchment lined baking sheet. Toast for 15 minutes, then set aside. Drain the fruit (conserve the liquid) and transfer to a food processor. Pulse until a smooth paste is formed. Add a bit of the liquid if needed to thin. Over the stove top, or in a microwave, melt the peanut butter. Once melted, stir in the vanilla and maple syrup. In a large bowl, combine the toasted oats, nuts, cherries and coconut. Use your hands to toss together. Add the apricot and peanut mixtures to the bowl. Stir well to combine and incorporate. Transfer to a baking dish and using the back of a spatula, press firmly on the mixture. Use any size dish you like - smaller dish, thicker bars. Cover with plastic wrap and place in the fridge for a few hours (or overnight). To serve, "slice as you go" out of the pan, or remove them all and package individually for quick, on the go, snacks.